In his Syrian travelogue The Street Philosopher and the Holy Fool Marius Kociejowski celebrates the two characters in the title as "non-mainstreamers". 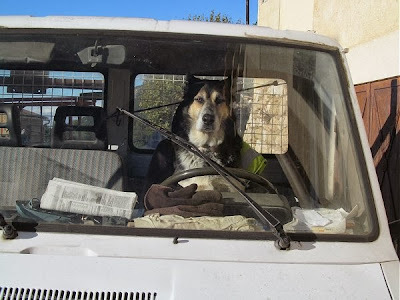 While others have appointed themselves as cultural commentators I prefer the roles of street philosopher and holy fool, so, accordingly, my recent travels enthusiastically embraced the non-mainstream. 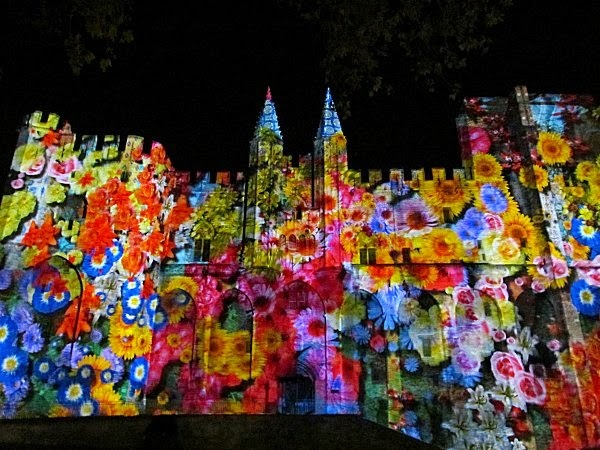 For the 1500 mile round trip to l'Abbaye Sainte-Madeleine in Provence I chose to travel by train rather than plane or car, which, thankfully, cushioned me from the kind of French driver captured in the header photo And my journey was rich in distinctly alternative experiences including the concert seen below; while I also took the distinctly non-mainstream decision to disconnect myself from the internet for the entire ten day trip. One of the many benefits of train travel is the non-mainstreamers it brings you into contact with. Seen below are the two delectable young ladies who sat next to me on the four hour high speed train journey from Avignon to Lille. 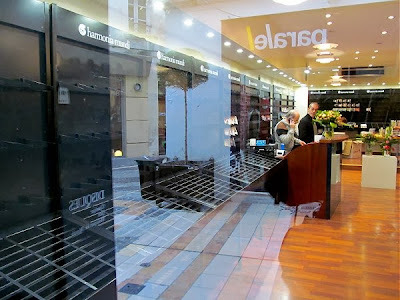 En route to the monastery at Le Barroux I was dismayed to find the priceless Harmonia Mundi shop in Avignon being dismantled - see photo below - which left me fearing the worst. 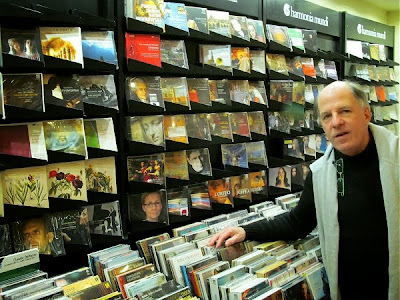 But the shop's tireless manager Pascal hastened to reassure me that all was far from lost, and, as recounted below, this story of non-mainstream bricks and mortar music retailing had a happy ending. 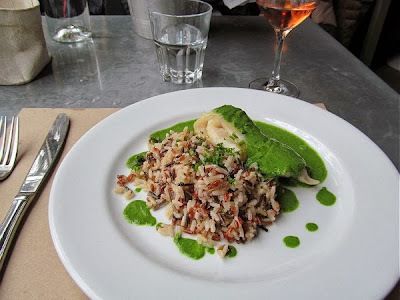 Although my ultimate destination was an austere Benedictine monastery this did not preclude sybaritic diversions, and below is the Cabillaud avec sauce à l'epinard et riz sauvage that I indulged in at the ever brilliant Chez Serge in Carpentras on the final leg of my journey to Le Barroux. But enough of this frivolity, here is the forbidding sign which greets visitors at Le Barroux. 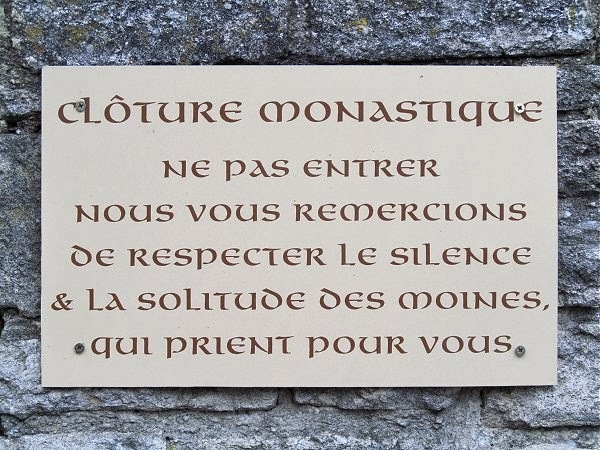 It reads 'Monastic Cloister - Do not enter. 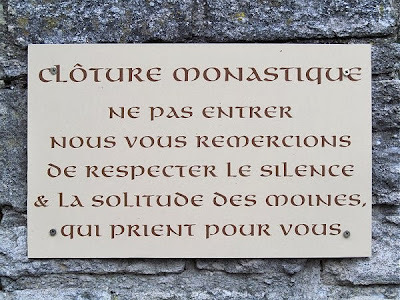 We thank you for respecting the silence and solitude of the monks who pray for you'. And this was my home for a week. 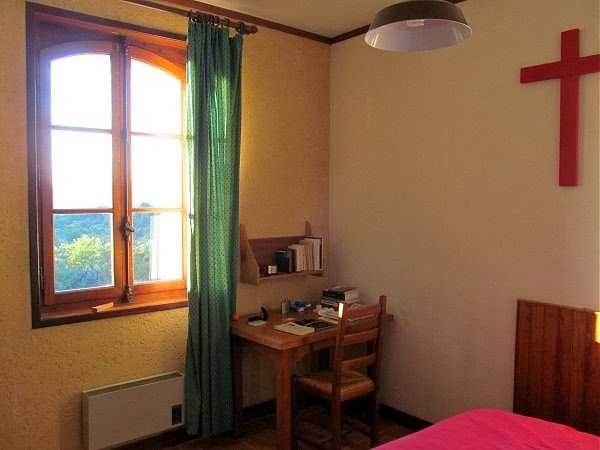 Guest rooms at L'Abbaye Sainte Madeleine may be spartan, but which 5 star hotel offers all inclusive Gregorian chant and unlimited Bliss? Moreover not many 5 star hotels are surrounded by the stunning scenery seen below. This photo was taken on the morning of 22nd November, which was Benjamin Britten's birthday (and mine!). In the background is Mont Ventoux which Petrarch celebrated in his Epistolae familiares and which, in turn, inspired Liszt in his Années de pèlerinage. 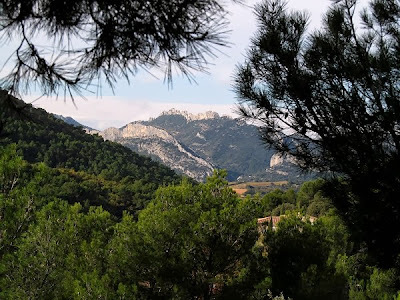 Visible in the middle distance is L'Abbaye Sainte-Madeleine's sister house l'Abbaye Notre Dame de l'Annonciation whose nuns featured in the high profile Decca recording that prompted a typically trenchant post several years ago. The 'ragged edge' plays an important part not only in how sound comes into our awareness - haltingly at first - but also in how life works as a whole and how we learn and practice. 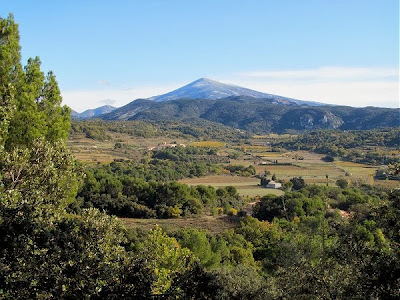 John Cage famously explored the ragged edge of silence in 4' 33" and, in a far more modest way, I was able to explore it both in the silence and solitude of the monastery and on long hikes in the breathtaking scenery seen below. Aldous Huxley - who coincidentally, or more probably not coincidentally, died on November 22nd - recommended the combination of LSD and Bach's Suites for Orchestra as a tool for exploring the hidden dimension of the mind. My own experiments on these long hikes listening to the Bach Suites and other transcendental masterworks such as Rubbra's Sixth Symphony on a non-chemical and non-addictive iPod reinforced my view that the future of classical music lies with its mind expanding and god enabling potential, and not with its ability to entertain. Those who are uncomfortable with linking music and religion may find comfort in the assertion by Henry Wieman (whose philosophy was the subject of Martin Luther King's PhD dissertation) that God is not a Creator but a creative force - superhuman but not supernatural - which can release forces that transcend the orthodox limits of human creativity. 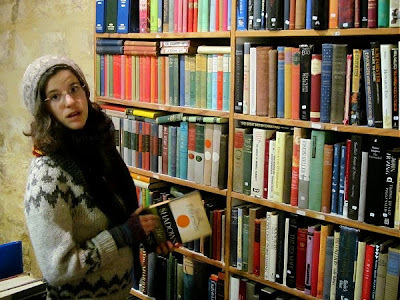 Environmental activist, author and harpsichord pioneer Wolfgang Zuckermann has explored the ragged edge where technology meets society, and my first port of call for post-monastery decompression was his Avignon bookshop which has been reincarnated as Camili Books by its new owner Camille Vourch who is seen below. Internet retailers have decimated bricks and mortar booksellers, so it was a delight to find Camille's store swimming strongly against the mainstream and really humming. An appropriate bonus from my brush with the ragged edge of both silence and book retailing was finding on the shelf a signed copy of Kristiaan Inwood's Bhikku: Disciple of the Buddha. In Avignon the non-mainstreamers are currently on a roll, and a short walk took me from Camili Books to the now restocked and reopened Harmonia Mundi shop. The Harmonia Mundi retail chain's struggle against internet competition has been hampered by its policy of only selling HM distributed titles; but now that has now changed and the rump of the shops that have avoided closure now carry releases from all labels irrespective of distributor. Manager Pascal - seen below - was a very happy bunny (lapin?) 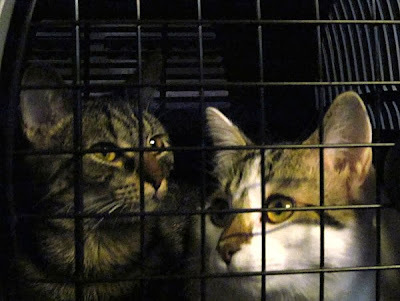 when I returned last week. But he has a tough fight on their hands, so I made a small contribution by buying the new Arditti recording of Toshio Hosokawa's string quartets. The peerless Gregorian chant of the monks was not the only live music on my trip. 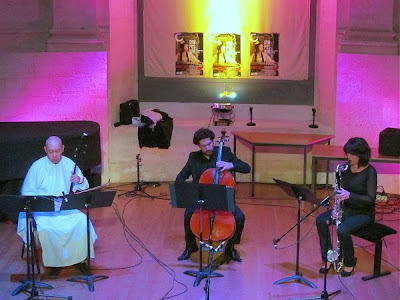 There was also a distinctly non-mainstream concert at Avignon Conservatoire as part of a symposium on Orientalism in music. In photo 2 above the mystery instrument is the Chinese erhu and the photo was taken during a performance of Laurent Martin's Lento for erhu, cello and bass clarinet - see video here. Laurent Martin studied with spectralist Gérard Grisey and the impact of Lento at the concert was so great that it was immediately repeated. Avignon's Conservatoire is named after Olivier Messiaen who was born in the city; although, as explained in a post a few years back, nobody seems to know exactly where in the city he was born. 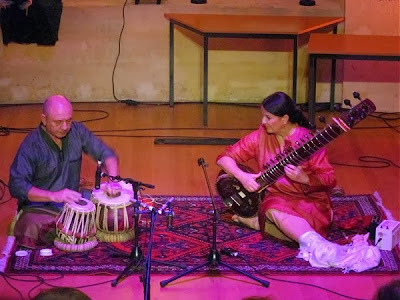 But, given Messiaen's links to both Avignon and Hindu rhythms it was good to see the concert including an evening raga played by Duo Saaj who are seen below. 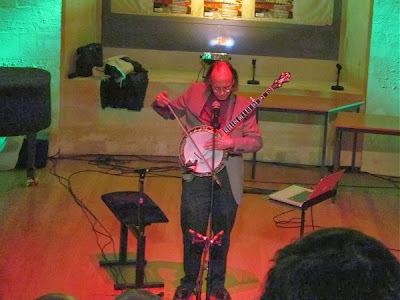 Non-mainstream synchronicity abounds here as author of The Ragged Edge of Silence John Francis is an accomplished banjo player and my next photo from the concert shows composer, professor of composition at the University of North Carolina and banjo virtuoso Paul Elwood playing one of his own compositions; and yes, Paul is playing his banjo with a bow and, another yes, his other instrument is a Mac. Video interview here, and music sample here. Also in this epically non-mainstream concert was a set by the ensemble Nekouda (which includes a hurdy gurdy) of songs from the historic Jewish communities in Provence - video sample here. 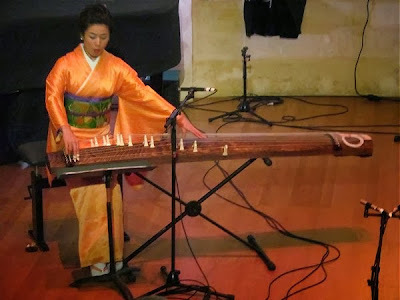 But, having recently written about Henry Cowell's Koto Concerto, the highlight for me was the opportunity to see and hear a koto in the flesh, with Fumie Hihara - seen above - playing contemporary compositions with shakuhachi flute vituoso Véronique Piron - video sample here. Sensory overload was setting in, but there was still more to come. 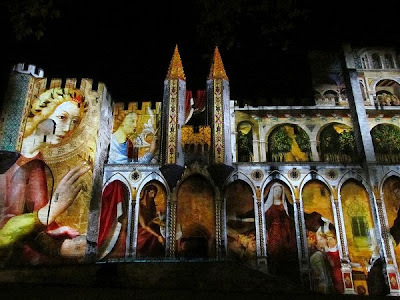 On my final evening I took in the winter version of Les Luminessences d'Avignon which is seen in my final three photos. Animated computer graphics are projected onto the facade of the 14th century Palais des Papes - video sample here - to produce a multi-media experience that was, for me, genuinely mind expanding. Considerable exposure has been given On An Overgrown Path to Norman Perryman's pioneering fusion of kinetic art and classical music. I have much sympathy for the viewpoint that great music can stand on its own without visual enhancement. But we cannot ignore that audiences - and not just young audiences - are becoming more visually and less aurally attuned. There are very few activities today other than classical music that involve just sitting and listening; church services and school lessons are the only others that immediately spring to mind, and neither of those are exactly box office hits. It is not just tastes that are changing; as reported here previously new technologies are literally rewiring our brains. The challenge is how classical music can adapt to audiences who understand the visual better than the aural, while avoiding throwing the baby out with the bathwater. In Native American traditions, as well as in both Western and Eastern ones, an individual must periodically withdraw from the material world in order to attain peace and inner knowledge through silence and solitude. In the Native American Belief system, shamanism, the vision quest ritual, as well as the modern-day vision quest, is directly related to the experience of silence. As John Francis says, we must periodically withdraw from the material world in order to seek, if not attain, peace and inner knowledge, and my visits to l'Abbaye Sainte-Madeleine are part silent retreat in the Western tradition and part very modest vision quest. In a radio interview Jonathan Harvey spoke to me about the crucial transition from linear thinking based on past patterns to a world view of the future that transcends temporal constraints. Silent retreats and vision quests are hugely productive legacies of linear thinking, and we now need to find ways of adapting these invaluable tools for the technology driven future. Tibetan Buddhism - which Alan Watts described as Roman Catholicism on LSD - teaches that there are two realities; one is the conventional (or relative) reality that we encounter everyday, the other is the absolute (or ultimate) reality. Just as John Cage eliminated composed sounds in 4' 33" to let us hear ambient sounds, so we need to periodically eliminate the illusory reality of the virtual world to allow us to reconnect with absolute reality. The final stage of my decompression was the Lille to London Eurostar train which was packed with bureaucrats and businessmen returning from Brussels. Every single person around me had their head in a mobile computing cloud, and if the Messiah had made his Second Coming on the 18.35h Lille to St Pancras Eurostar not a single person would have noticed. But if the Second Coming has been trending on social media everyone on that train would have been aware in seconds. 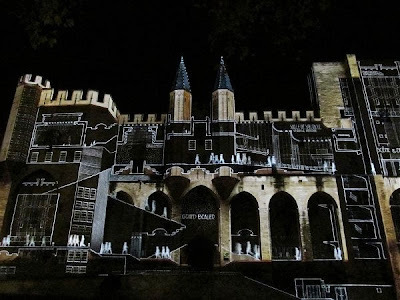 Of course new technologies bring huge benefits: even though I was offline during my travels much of the planning was done online and, ironically, this critique of illusory reality only exists as illusory reality. However, although I make no claims to being be a shaman, my vision quest reinforced the view that the internet has created a world of relative reality that is increasingly - and harmfully - divorced from the absolute ultimate reality. Street philosopher and holy fool I may be, but my priority in the coming months will be to spend less time in the online world of illusion and more time exploring the absolute reality that is found on the ragged edge of silence. My thanks go the community at l'Abbaye Sainte-Madeleine du Barroux, and in particular to Brother Paul and Father Edmund for welcoming a street philosopher and holy fool. All costs associated with this trip and post were self-funded. Photos are all (c) On An Overgrown Path 2013. Any other copyrighted material on these pages is included as "fair use", for the purpose of study, review or critical analysis only, and will be removed at the request of copyright owner(s). Also on Facebook and Twitter. The first picture is shocking. No seat belt! "Superman don't need no seat belt."